Homo sapiens are an awfully vain species. We love to go on about our big brains and our opposable thumbs  and the fact is we wouldn't be good for much at all without them. But there's one human attribute that doesn't get nearly enough attention: the ability to throw stuff really, really far. According to a new study published in the journal Evolution and Human Behavior, not only were a rifle arm and good aim essential for our early survival, they are also innate talents, hardwired into all of us from the moment of birth. Humanity's rapid rise to top dog on a planet that teems with competing species was never a sure thing. We're slow, we're soft and while we do have good teeth, they're nothing compared with those of the big cats or the great apes. What we needed to defend and feed ourselves was a way not just to kill predators and prey, but also to kill them from a safe distance  first with rocks and later with spears. "The ability to throw great distances was not a small thing," says Geoffrey P. Bingham, an experimental psychologist at Indiana University. "It was how we got lunch. We are the only animals  and even the only primates  with that talent." Bingham has been studying throwing ability for more than 20 years, and his work has always been made more challenging by a trick of human perception known as the size-weight illusion. When people look at two similar objects of different sizes  a ball with a diameter of 3 in. (8 cm) and one of 5 in. (13 cm), say  they expect the larger one to weigh more. Often it does, but since weight is a function not just of size but of density and mass, it can just as easily weigh less. Things get especially tricky when the weight of the different-size objects is exactly the same. When subjects heft the equal-weight, different-size balls, they will typically perceive the bigger one as being lighter. This happens among adults, it happens among small children  it happens even when people are told the weight in advance. "It's an extremely robust phenomenon," says Bingham. Researchers have never established exactly what's behind the size-weight illusion, but one possibility is the simple matter of expectations. Before we pick something up, we begin tensing muscles in the arm and hand to accommodate the anticipated weight. If that weight turns out to be less than we guessed, we bring more muscle power to the job than is necessary, making the object feel unexpectedly light. Such imprecise judgment ought not be a good thing for a species that relies on throwing to stay alive. 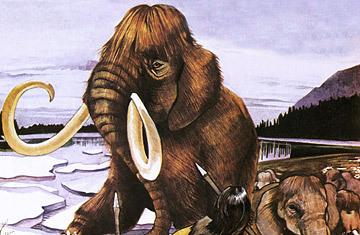 If you're trying to bring down a woolly mammoth with a rock, it's best to be able to select exactly the one you can throw farthest and hardest. Bingham's recent study was designed to determine if the size-weight phenomenon indeed misleads us, or if we maintain the ability to choose the best projectile despite that illusion  and perhaps even because of it. In his experiment, Bingham recruited six male and six female students, with a mean age of 24.6. All of the subjects were presented with three sets of a total of 18 objects. Six of them were balls of a fixed weight  2.4 oz. (69 g)  that varied in size. Six of them were balls of a fixed diameter  3 in. (8 cm)  that varied in weight. Six were objects of a constant density that varied in both size and weight. Weight, density and diameter are the three critical qualities that determine how far and fast objects thrown with an equal force will travel. The subjects were told to heft the objects and choose the ones they believed they could throw the farthest. As a rule, when they picked up two balls of identical weight but different size, they would reject the larger one, believing it too light to go far enough. In its place, they would usually choose a somewhat heavier one. In effect, the size-weight illusion was nudging the subjects to increase the weight of the projectile they chose  theoretically maximizing its deadliness. Certainly, the heaviest ball isn't always the best. The arm strength of the thrower has to be up to the job and in order to get any oomph behind a projectile, the average child  or, for that matter, the average adult woman  would have to choose a lighter object than the average adult male. The key, then, is to find the right balance of size, weight and strength. As it turned out, that was a balance Bingham's subjects struck well. When all of the balls they had chosen were charted on a graph, they produced a series of size, weight and density curves that tended to converge at a peak that maximized their flight-worthiness for each individual. When the subjects were actually asked to throw the balls, they were indeed able to make the ones they'd chosen fly farther than the ones they'd rejected. As with all human abilities, projectile selection is a talent that some people have in greater abundance than others. Even in Bingham's research, the skill was unevenly distributed. Everyone, however, is born with at least the basic skill set, and all of us get better with practice. "You acquire the ability at the same time you're learning to throw," says Bingham. That was very good news for your most distant ancestors  and very bad news for a long-ago mastodon.